Ah, the leaves are turning, a crisp smell is in the air, and placards abound in front yards across the land - election time is here, friends. While the citizenry ponders whether to vote for the devil they know, or to turn to the devil they don't, I could care less. In Canada, we don't bother with elections, we just elect people who will sleep with hockey players. Is it a better system? Hard to say, but it's certainly about as effective. 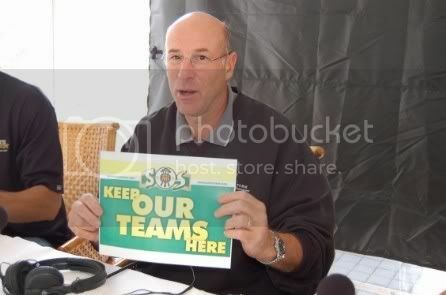 In any event, you're probably wondering just what the hell this has to do with the Sonics. 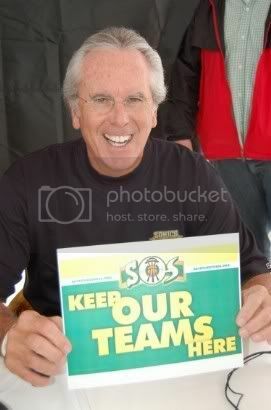 Well, skeptic reader, supersonic.com is currently running a poll to name the GREATEST PLAYERS IN SONICS HISTORY. Up first, the pioneers, the Sonics who put in the time and effort to build a team that would, well, most likely move to Oklahoma in a couple of years. Sigh. Let us know who you think merits a vote. Personally, I marked my ballot for Haywood, Wilkens, and Downtown Freddie Brown, because, well, anytime you get a chance to vote for Fred Brown you should just do it. Honestly, Bob Rule deserves it more, but unless his nickname was Bob "Cool is the" Rule and I wasn't aware of it, he's not getting my vote. 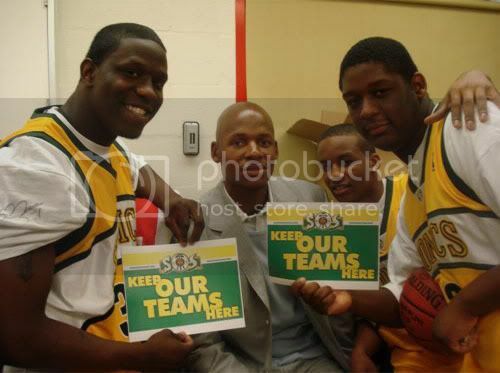 Ray-Ray with the Cleveland High boys basketball team. So, not much to report from supersonicsoul land. 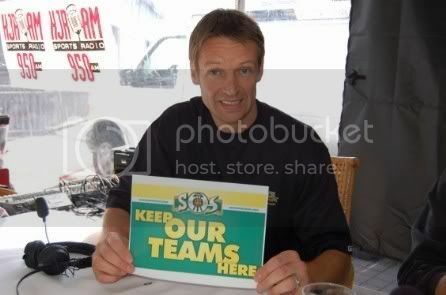 But there's plenty going on with our hard-working pals at Save Our Sonics & Storm. As you may know, these folks have been a presence at the last Storm games, the Sonics Legends Tour events, a KJR fundraising thingy, probably the Seahawks and Huskies games too. I have been helping out, as best as a hermit can, on the promo side by creating signs and stuff for them to hand out at games and PR events. 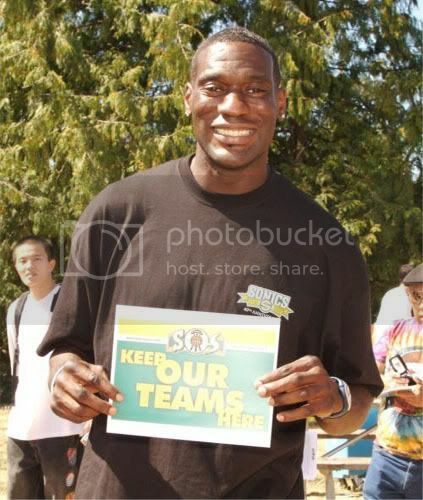 I haven't been able to see the signs "in action" myself, so when I saw the following pictures of SONICS LEGENDS holding them I was knocked out of my socks. Dude, the way I freaked when I saw these, you'd think they were pictures of me throwing an oop to Kemp in the 96 Finals. This might be the closest I'll ever get to that. Today's Sonics flashback features Seattle's first trip to the Finals. Now if only I could find a video from the next season! It's video time again. Today, we get a heart-breaking glimpse at what might have been: The '96 Finals. (Sigh.) The video is a bit low-res, but at least you get to see The Glove dunk on Jordan. (Sigh x2.) FEED THE HAWK! Hey folks! Since Sonics news is a little slow right now, we're going to do what my old English teacher did when he ran out of stuff to teach . . . show videos! All this week, we'll be showing vintage Sonics videos. Today: The Glove's fighting technique is unstoppable! Like the rest of you, I was more than a little shocked to hear that the US dropped an egg to Greece in the FIBA tournament (aka "You Want Sweaty and Hairy White Guys? We've Got'em!"). Dale Hawker: Why has no one discussed Spain beating Argentina? This is a bigger upset. Greece was the Euro champs ,so beating the U.S. should not come as a surprise, as they have the experience and big bodies to do it. Argentina, on the other hand, was hyped as the best team in the tournament. They have the experience from the Olympics, the team cohesiveness as Ginobili et al, have been playing together for years and all the commentators had them beating the U.S. So why isn't the Argentina loss being scrutinized and discussed? Because according to American media outlets they were suppose to win, not the USA. Um, Dale, because I'm guessing that Spaniards aren't spilling onto the streets and stopping traffic to celebrate their win the way the Greeks are. No matter how you slice it, knocking off the US is the ultimate goal of every team, especially when you throw in the political ramifications. Anyways, the key issue in my mind is this: This team is not the best display of US talent by a long shot. What's that? You don't believe me? I'm an American apologist? Well, linger on this: There were 12 Americans named to the 3 All-NBA teams at the end of last year. Guess how many of those 12 were in Japan. Go on, guess. 4. That's right, 4. Kobe, Shaq, Chauncey Billups, Duncan, Ben Wallace, Gilbert Arenas, Iverson, and Shawn Marion are all stateside right now, while Shane Battier continues to do his impersonation of an NBA player in Japan. In my mind, the reason the US keeps losing is that their big men refuse to participate in these events because of the cumulative wear and tear on their bodies. If you honestly think that Wallace, Shaq, and Duncan wouldn't have made all the difference in the world, well, you're either a fool, or Greek. You can have Baby Shaq, I'll take the definite article.